Rivers State chapter of the Peoples Democratic Party, PDP, has commenced re-registration of old and new members into the party across the 23 Local Government Areas of the state in preparation for the June 16th, 2018 council polls. Addressing council Chairmen and Secretaries of the party at the PDP Secretariat in Port Harcourt, yesterday, state Chairman of the party, Mr Felix Obuah, charged them to take the message to their respective LGAs and ensure that the exercise was given the seriousness it deserves. He urged the party executives to go into all the Wards across the state and ensure that all the decampees from the All Progressives Congress, APC, and other political parties are registered. While handing over the party registers to the Chairmen, Obuah charged them to immediately reach out to the Ward Chairmen and Secretaries and ensure that the exercise kick-starts in earnest. He warned that on no condition should the membership cards be hoarded, adding that even though most of the cards had expired, arrangements were being made to give out the new cards before the end of the day. 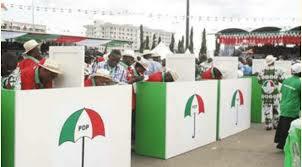 Obuah said the party will charge a token for the cards to ensure that members make financial commitment to the party. He warned against adoption of candidates for the various elective positions in the forthcoming local government elections. He said it will be out of place for him as state party Chairman to supervise such undemocratic practice, adding that the PDP was committed to upholding its constitution and give every aspirant a level playing ground. “So it will be bad of you as a leader who is supposed to be an unbiased umpire to adopt one person and follow him or her to campaign. It is unfair and does not encourage,” he said, warning that the party will not hesitate to use its hammer on any chairman who indulges in such act.